The hottest bowl in town… Poke. 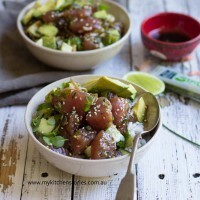 I have Very Easy Tuna Poke Bowls. You will love ! It’s made it to Australia and is quickly becoming as popular here as it is in the US. Judging by our love of sushi and sashimi it is going to be avaiable on a street corner near you soon. 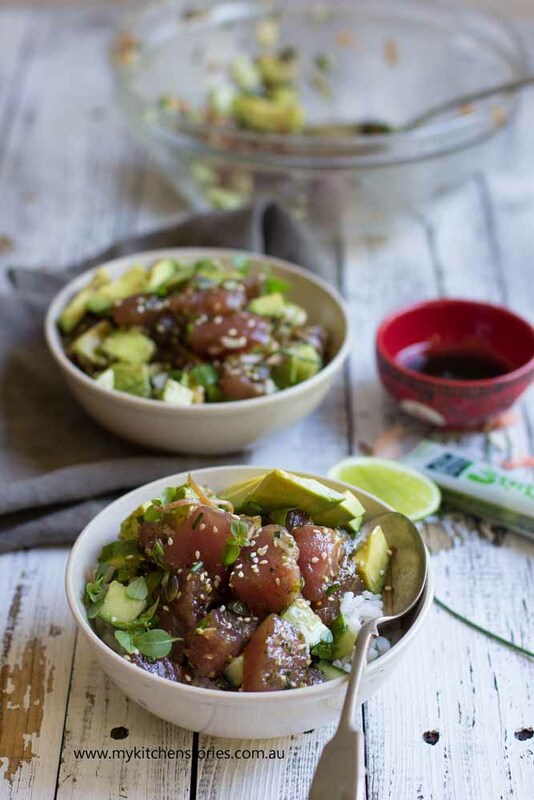 Poke ( pronounced POH-KAY, not POKE-EE) is raw fish served as an appetiser or starter and originated in Hawaiian Cuisine. It’s much like Ceviche, however it doesn’t really have a strong acidic component that ” cooks” or flavours the seafood. 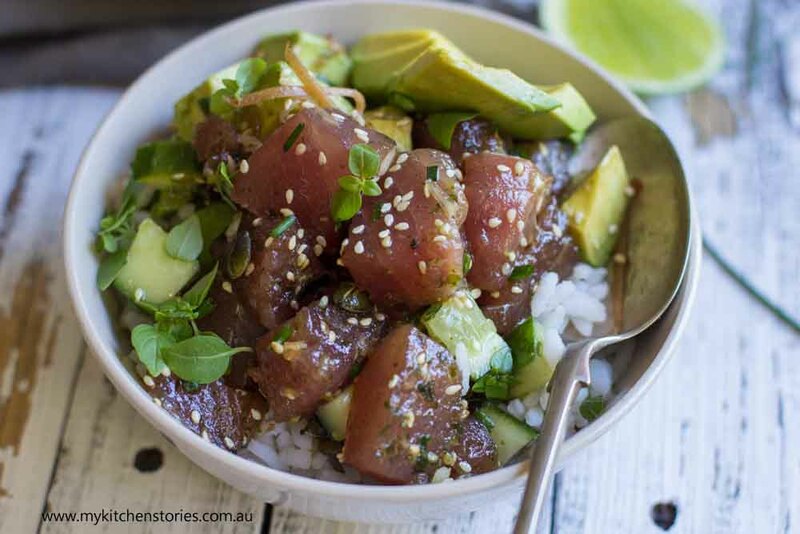 Poke means chunk or slice or section depending on who you read and it began as a fishermans snack. The workers would season up the offcuts from their catch. Seasonings are heavily influenced by Japanese and Asian flavours like green onions, sesame, soy and furikake ( a japanese seaweed seasoning mix). See my BBQ whole salmon recipe. 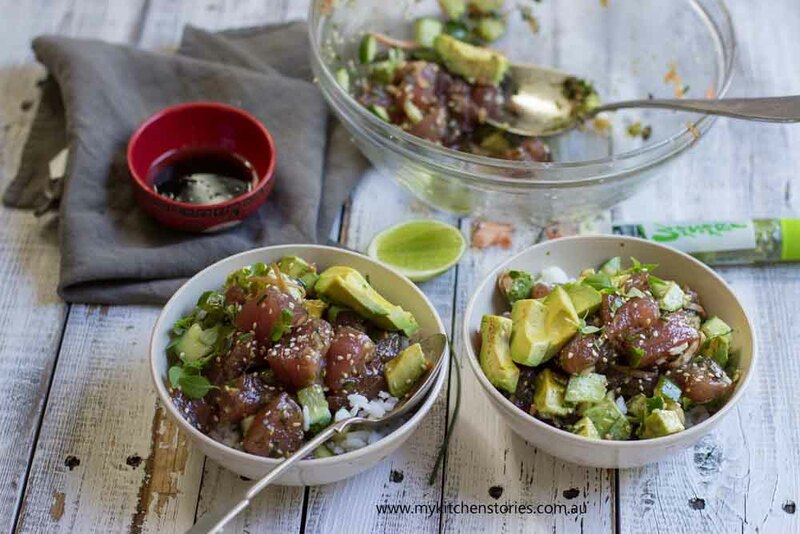 It can also be made with salmon, octopus, macadamia nuts and avocado. If you have travelled to Hawaii you will know it as a very common snack served anywhere and everywhere from grocery stores to service stations and cafes. It’s casual and the kind of food you can take to the beach in a take away container and love it as much as eating in a trendy restaurant in New York or LA, where it has become the latest hottest food. My version is new school, served on a rice bowl. You can find it on the mainland of the US from Los Angeles to Charleston and Brooklyn. In New York alone, the Hawaiian restaurant boom has brought with it some notable places to grab poké . Places like Onomea in Brooklyn, at Japanese-Hawaiian restaurant Suzume, and at Noreetuh, the modern Hawaiian restaurant punking up traditional poké with pickled jalapeños, fresno peppers, macadamia nuts, and multiple seaweeds. You can find a Poké truck, Poké to the Max by Sam Choy in Bellevue, Washington, where you can get Poké on salad bowls, rice bowls, and Poké sandwich wraps served with slaw and dressing. Yep, it’s a thing. You can find it in Sydney at places like Poke- Dudley Street, Coogee or Kobe Jones or try Showbox Coffee in Manly. I am sure there are lots more springing up even as we speak. Check your corner of the world. The most important thing to remember is very very fresh fish. Preferably sushi grade, but if you buy from a really good seafood market the freshest fillet of Tuna ( or salmon ) you can find is the way to go. I love the classics of soy and sesame but I do love to use the crunchy seaweed-y Furikake ( see the link above for a picture) and chopped macadamia nuts because of their texture. I also love to add Avocado. Add whatever you like. Check out my Video ! 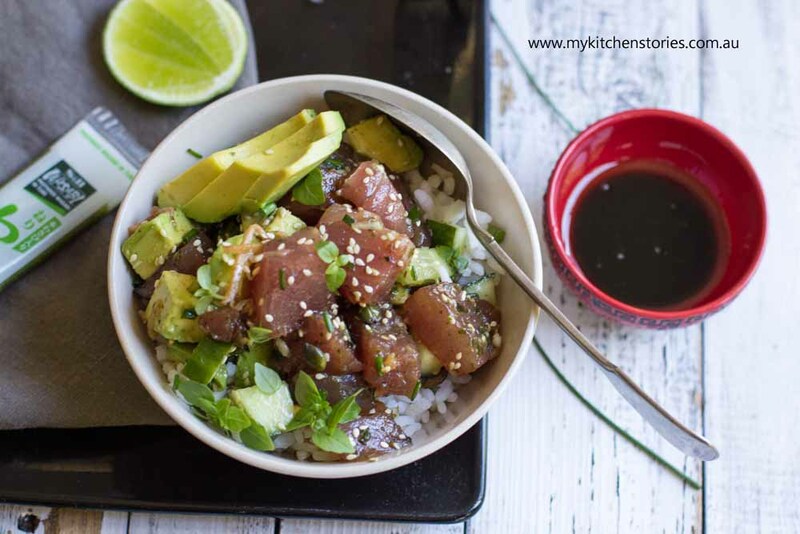 Mix the Tuna, soy, sugar, Furikake, maple syrup , chives ( or green onion) and sesame in a bowl and let stand for an hour in the fridge ( if time). Then mix in the macadamias, cucumber, toasted pepita seeds, sliced ginger and avocado and stir well. I had some pan seared tuna yesterday :-)) Gosh…quality tuna tastes so much better!! Your tuna bowl looks fanfreakingtastic, Tania. Oh how lovely of you to say that. Yes it was so delicious! Oh yes it is love at first bite. Lorraine @ Not Quite Nigella recently posted..9 Bangkok Sweets (Modern & Traditional) That You Must Try! 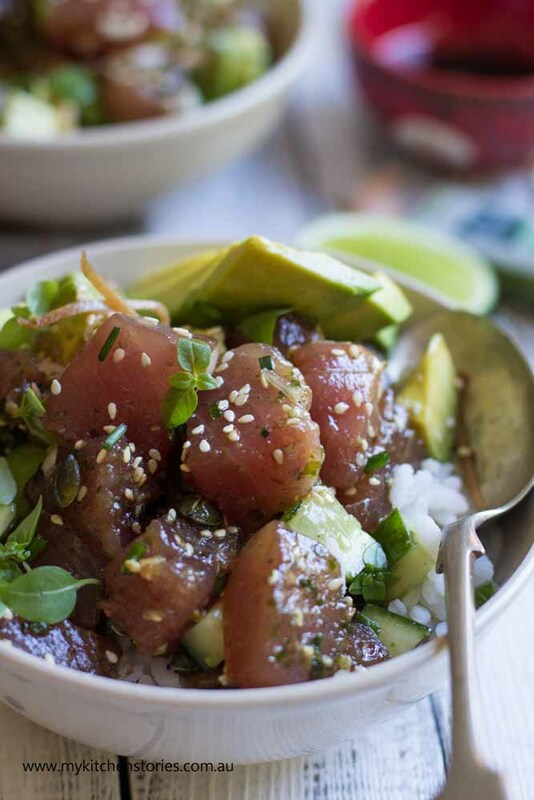 The Tuna Poke Bowls look delicious. Enjoyed the video, you made it super easy to prepare. Oh I could have a Poke bowl right now. Thank you so much for introducing me to them. I think it might be a while until the trend makes it up here so I’m so glad you have shared the recipe on YWF. I love the look of this. I feel I have been living under a rock. I officially have never heard of Poke, poke bowls or anything poke ‘food’ related. I have certainly heard of ceviche and similar, this has me so intrigued. What a fabulous recipe I’m excited to see more. YUMMMM! I love Poke. One of the main reasons I love to holiday in Hawaii! I don’t know why I didn’t think of something like this when my husband came home with a big ahi fillet for me to use the other day. Never thought of making poke at home. Ah well, now I have the idea for next time.